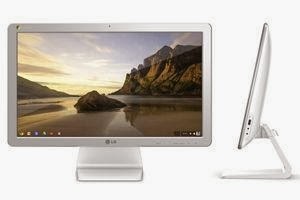 LG has announced the world's first Google-powered Chromebase All-in-One PC. The Linux-based operating system used to come pre-installed on laptops or boxes that required similar monitor, however, it would be a first PC to incorporate the system. According to the BBC, Chrome-based computers tend to be cheaper than Windows-powered systems, in part because Google does not charge manufacturers to include its software. Being cheaper has its drawbacks as the operating system runs only a limited range of applications and popular apps like Skype, Powerpoint, Photoshop and iTunes are unavailable, but can be downloaded from Google's free or paid web-based alternatives. The LG Chromebase desktop computer measures 21.5-inch with a 1080p full-HD screen that resembles Apple iMacs, HP's Spectre One range and Dell's Inspiron One family, which cost 700 pounds or more. According to the report, the Chromebase PC has just 16GB of storage, which is relatively a very low amount as Google intends to encourage users to store their data on cloud, thereby reducing costs. LG Chromebase desktop computer is expected to be launched in January at the Consumer Electronics Show (CES) in Las Vegasadded.